Skinny jeans aren’t by their very nature all that comfortable, although there are a few styles that are exceptions to the rule and are remarkable comfy despite being a close fit. The best selling, most comfortable skinnies are those styles that have a little bit of stretch and are made with a soft fabric. You also need to get a good fit, so they feel good to wear. We have researched all the brands and found the best places to get the best fitting, most popular and (most importantly) most comfortable skinny jeans. American Eagle has some of the best quality and most comfortable designs going. 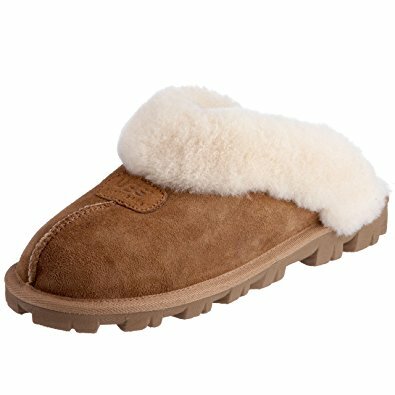 Their styles change slightly with different lengths and colors year to year, but their fundamental design remains very comfy. One of their best skinny options is the AE Denim X line. They are affordable, have a fantastic fit on most body types and can last for years. Because of the stretch of the fabric, you can get a nice snug fit without them feeling tight. The key to AE comfort is that they make their pants with material that is stretchy and soft but still looks like traditional denim. They also still feel like regular pants and not leggings, partly because most of the styles are slightly loose around the ankles, unlike a jegging. The Denim X come in different length options for short, regular, long, and extra long. They will fit nicely on most body types. Overall this is a great style to check out as they are durable, feel great, and look good. 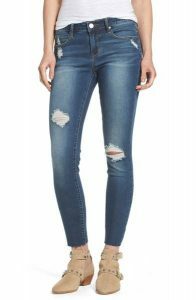 The Old Navy Rockstar line is an excellent option if you are looking for a skinny jean that is also inexpensive. The Rockstar is so famous that the line is available in high, mid or low rise and come in a tonne of colors and different lengths. They also sell a Rockstar Jegging that is pretty popular for many comfort loving women that I know. The feel of the fabric varies quite a bit across the different colors and styles of Rockstar, but they do all seem to have a significant amount of stretch in the material for most of the Rockstar styles. Stretch is essential so that you get the skinny look, but you don’t feel that the pant is too confining or challenging to move around in. What is terrific about the Rockstar is that they are so inexpensive that you can get multiple pairs in different colors and lengths, and not have to worry about the cost because they are often on sale. They’re a super flattering fit that you can dress them up or down, depending on the style and color you choose. 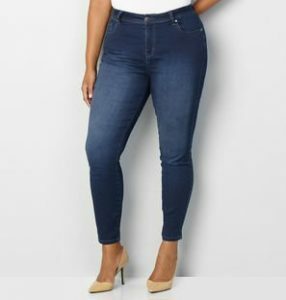 If you are looking for a shaping jean that is also comfortable, the H&M range of shaping skinny styles are well worth a look. What is nice about the H&M options is that they are primarily made from soft cotton that hugs all your curves. The denim includes a little bit of elastomultiester and spandex, so you have stretch, but they are still able to retain their shape. The most popular of the H&M styles has five pockets and come in three different colors — dark denim, blue denim, and black. The shaping feature of the pant means that it will hold and shape the tummy, thighs, and back, but not in such a way that it is uncomfortable. The ankle has a little bit of space at the opening and isn’t skin tight. They come high, regular or low cut and you can get them for around $50 a pair. For those of you who are looking for a designer brand, one of the best places to start is with Madewell. Their high rise skinnies are off the charts for comfort and fit. They will make your legs look longer and will shape your body in a way that you will love. The comfort of the premium denim on the Madewell Skinnies feels like leggings, so you can wear them all day long and still be comfortable. 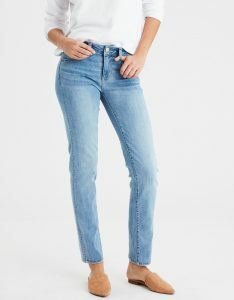 The Madewell High Rise Skinny is made from super soft, dark rinsed cotton denim that has strategic shadow creases and fading, so they look like regular denim material, but you don’t have the heaviness or the bulk of the thick fabric. Despite its softness, the material remains flexible and can hold its shape. This style is a high rise, so you can move around in them effortlessly and bend over without any worry of showing any skin that you don’t want to be exposed in the back. Sometimes high waisted pants can feel constricting when you are sitting, but this Madewell style doesn’t have that problem. 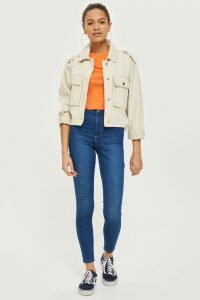 An always reliable place to get jeans is Gap and their 1969 True Skinny is, as you would expect, a comfortable, versatile style that is great for most body types. They come in a high rise and original, and you can get them in a variety of colors. Women who love this style say that they’re super flattering, fit true to size and that they like the stretchy fabric and detailed stitching. Topshop’s skinnies have a large and loyal following. Their two most popular styles are the Joni and the Jamie. Both are modern, comfortable and form fitting. The Jamie style feels more like classic denim than the Joni. Jamie has pockets and is made of denim that has a little bit of stretch. The Jamie doesn’t stretch out and is overall pretty sturdy. The Jamie is probably a little more durable than the Joni. The Joni is also a great option that is stretchy, super soft, and comfortable. They use a different material on the Joni, so they are more stretchy and form-fitting than the Jamie. They also don’t have pockets, are ultra skinny and ultra high rise. They are very close to being a jegging but are still generally considered a jean. The high-elastane means that they can hold you in and hug your curves in a flattering way, and shouldn’t stretch out over time. You can get the Joni in all kinds of colors, styles, and lengths. The only downside to the Joni is that they aren’t the most durable pants if you are wearing them regularly. Another designer style that is high quality and has a legging-like fit and feel are the Alina Colored Stretch Skinny from NYDJ. They are made with a lovely black stretch material that makes them a great option if you are looking for a black fitted pant. They do have quite a bit of stretch, so it is recommended that you size down with this style. The fabric is such that it is thick enough that you can wear them in the winter and still feel warm but without the bulk of regular denim material. They are also the very popular high rise design, so they have good coverage over the tummy and at the back. A problem that you can run into with a black pant (or most black clothing) is that the color will fade quite a bit after washing, luckily the Alina, by most accounts, can hold its color wash after wash as long as you following the washing instructions. 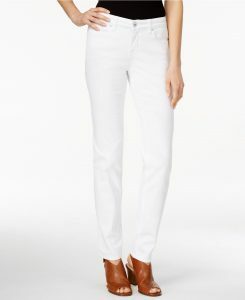 A skinny style that is popular for a curvy fit is the Style & Co Curvy-Fit Skinny Jeans. It has a fitted look to it, but the leg isn’t skin tight. It is reportedly super comfortable, soft and should fit well with curves without adding bulk. They are also said to be very flexible so that you can move around in them quickly, even bending over shouldn’t cause most women any trouble with this style. It comes in 6 nice colors that wash well and will hold their shape as you go throughout your day. The fit is said to be slimming for most body types, and they are inexpensive, especially if you can catch them on sale. 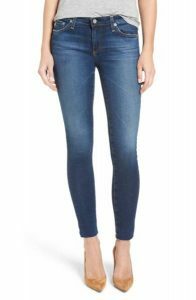 AG Legging Ankle Jeans are a nice pair of dark-blue wash cut with a very skinny fit. They have trendy raw hems and are a low rise design. 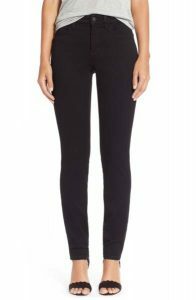 It is a very fashionable and flattering fit if you love a skin-tight look and feel to your skinnies. The fit is a little tighter than some of the other options on this list, so you won’t get the baggy look of the fabric like some leggings with stretch can cause. The raw hem is surprisingly clean and edgy looking, and they are also a great color with a little bit of fading to give them a slightly distressed look. A lot of women say they are as comfortable as wearing leggings because of the soft, stretchy fabric, which is why they have the name that they do. AG pants also generally wash really well and don’t get baggy after a few wears. 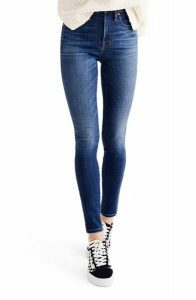 The Skinny Jeans in Bedford from rag & bone are another great designer option if you are looking for a comfort fit, especially if you are tall, as this style tends to run a little long. It is a durable style that will hold its color and shape after repeated wearing and washing. They are an excellent fit on most women, along as I mentioned they are a little long in the leg. The waist is mid-rise waist, and they are a bit stretchy but not too much, which makes for a great fit on the legs. They are perfect style to dress up or down since they have more of classic denim feel to it than a jegging or legging. A favorite skinny brand for curvy figures is Butter Denim Jeans. They are made with extremely high-quality denim, that feels super soft and stretchy without being skin tight. The high-quality fabric is said to be very durable, so you should get many years wear out of this brand. This mid-rise style comes in a variety of pretty, flattering colors. The design features a zipper and button closure with belt loops. It has no functioning pockets at the front, but there are two pockets at the back (pockets tend to add unnecessary bulk). The fabric is a blend of cotton, polyester, and spandex. Articles of Society have a reputation for making comfortable pants. If you love a low rise style, then the Sarah Skinny Jeans are worth checking out. 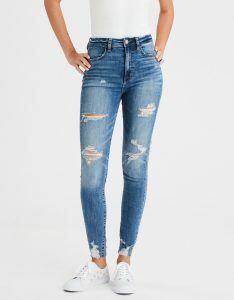 They are both soft and comfortable, and they don’t stretch out much as you go about your day They have nicely done trendy distressed detailing, and the raw edge hem at the bottom makes it easy to trim them a little shorter if they are too long. These are an excellent option for anyone who craves a designer fit with a relatively affordable price tag. Levi’s have a few different skinny jean options in their 700 Series. The 700 series has styles that are updated and more modern than what you may associate with Levi’s. They are made with stretch denim and that are designed to flatter, hold, and lift. 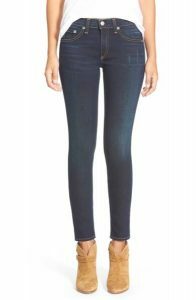 You can get skinny, super skinny, sculpting skinny and one that I loved for pure comfort the 720 Hypersoft High Rise Super Skinny Jeans. There are lots of options for different rises including a high rise in both ankle and regular lengths. The fit of most of Levi’s skinnies is pretty snug; most styles seem to be particularly fitted at the ankle. The ones I tried on had a nice stretch to the material and weren’t uncomfortable at all. 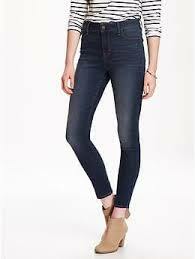 Levi’s skinny jeans feel and look like you are wearing jeans not leggings, but are still very soft and comfy without feeling too stretchy. If you aren’t sold on the idea of skinny jeans being comfortable, but you love the look, you should check out jeggings. They aren’t for everyone, but as far as comfort they are superior to most regular skinny jean styles. 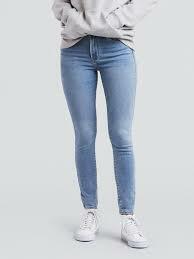 The best jeggings are the jeggings from American Eagle; they have a bunch of different fits that are great including their Super Soft Jeggings. They are stretchy, look like jeans not leggings, and are incredibly flattering. They can run a little bit tight depending on the sizing you go for, but they are one of the best options for wearing all day, whether you are sitting or standing.